Are you trying to eat more meatless meals? 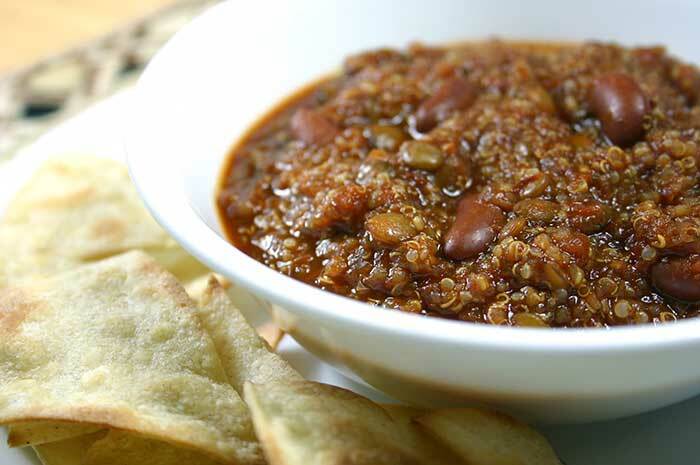 This quinoa lentil chili featuring dried chile peppers and kidney beans is both vegan and gluten-free. We’re entering the third week of the Virtual Potluck Tasty and Healthy New Year Challenge featuring products from Bob’s Red Mill and California Olive Ranch. Once a week for the first four weeks of the year, we’ll be pairing a flour or grain with an olive oil and creating a dish using both. Our third course challenge is to create an entrée with Quinoa (say “KEEN-wa”) and Arbosana Extra Virgin Olive Oil. I decided to create a vegetarian entrée in the spirit of being “tasty” and “healthy.” Once I found a stash of dried chile peppers in the pantry, I knew this quinoa lentil chili wouldn’t require a trip to the store. Plus, who doesn’t love to eat chili in January? This version of chili is thick and earthy, yet very smooth. I usually add chunks of tomatoes, meat and other vegetables, so this texture was a nice change of pace. (I know I’m supposed to be going vegan here, but this quinoa lentil chili – minus the beans – would be perfect for slathering on hot dogs.) I love the way the quinoa provides a caviar-like “pop” in your mouth. Arbosana EVOO is a “complex, nutty oil with flavors of fresh tomato and almonds.” I’m not sure my palate was able to discern the tomato flavor, but the nuttiness was certainly there. COR is absolutely right when they say Arbosana is fabulous drizzled on stews. Chili is stew, right? The one thing this quinoa lentil chili is lacking is crunch. I always need crunch with a meal or I still feel hungry afterwards. I took some corn tortillas (if I’d had time I would have used Homemade Corn Tortillas), brushed them with Arbosana, cut them into wedges and baked them at 400°F for about 8 minutes. These homemade tortilla chips provided the perfect amount of crunch. I used about ½ teaspoon of the olive oil for each 6-inch tortilla. One tortilla (6 chips) adds about 70 calories, 3g fat and 11g carb. In a large, dry skillet over medium-high heat, toast both types of chile peppers on each side, about 2 minutes. (Don’t let them burn!) Place chiles in a large bowl and cover with boiling water. Place a smaller bowl or plate on top of the chiles to keep them submerged and let stand at least 30 minutes to rehydrate (longer is better). In the same skillet, toast the cumin and coriander seeds for about 5 minutes over medium-high heat. Grind the seeds into a powder using a coffee/spice grinder or mortar and pestle. Drop garlic cloves into a running food processor to finely mince them, then turn off processor. Reserve 1 cup of liquid from the chiles and add it to the food processor along with the chiles, ground cumin and coriander, oregano, and tomatoes with their liquid. Process until smooth. Heat the olive oil in a Dutch oven or large pot over medium heat. Add the quinoa and lentils and toast for about 5 minutes, stirring occasionally. Add the chile mixture, water, and onions. Bring to a boil, then reduce heat, cover and simmer until the lentils are tender (at least 30 minutes). If your lentils are old, they will take longer to cook and you may need to add more water. Keep an eye on it. Once the lentils are done, add the kidney beans and simmer for about 5 more minutes, until the beans have warmed up. Too many carbs for you? Reduce the amount of quinoa, lentils, and/or beans. Bob’s Red Mill and California Olive Ranch gave one lucky reader a bag of Quinoa and a bottle of Arbosana Extra Virgin Olive Oil. The contest ended at midnight Eastern on Sunday, Jan. 22, 2012 and the winner was announced on Mon., Jan. 23, 2012. Disclosure: I received free samples of Quinoa from Bob’s Red Mill and Arbosana Extra Virgin Olive Oil from California Olive Ranch. I also received samples to give away on my blog. My husband would never go for this but I’m saving the recipe for next time he is gone! Next week, Vanessa. Next week. Your use of the quinoa and Arbosana Olive oil is a great twist on an American classic. Looks like it would keep an Eskimo warm on a winter’s day in Alaska. I like the added touch of the chips, I usually have bread with chili, but this sounds even better. Great recipe! Wow Shelby….I’m loving this idea of incorporating quinoa into chili. You rock sister! I’ve actually used quinoa in chili before and it was good. I would love to try the Arbosana olive oil. I like the idea of using lentils in chili; I always have them on hand. And the Arbosana olive oil is a good way to start it. Arbosana olive oil sounds like a great addition to my kitchen. Just tried quinoa for the first time on Sunday so am really enjoying all the recipes this week. I wouldn’t have thought to toast the quinoa and lentils in Arbosana olive oil. Did you do this to add to the flavor? Rachel – Isn’t quinoa great? Yes, toasting the quinoa and lentils first brings out a smoky, nutty flavor. Never occurred to me to use quinoa in chili. Looks good. I like Arbosana olive oil. Love love love lentils…will have to try this. My whole family, including kids ages 10, 12, and 14 loves quinoa. We also go through A LOT of EVOO, especially since DD has started sautéing veggies a couple of times a week. We also love Bob’s Red Mill beans, so I think I’d put a variety of beans in this, rather than just kidneys. My whole family, including kids ages 10, 12, and 14 loves quinoa. We also go through A LOT of EVOO, especially since DD has started sautéing veggies a couple of times a week. We will have to try the Arbosana variety, and soon! We also love Bob’s Red Mill beans, so I think I’d put a variety of beans in this, rather than just kidneys. I follow all 3 on Twitter and tweeted! I love this, it looks like amazing chili! I’ve looking for a lentil recipe that is different than my normal. I don’t have quinoa, could I use something else? Wendy – I like quinoa because it has so much protein. You could also use bulgur, rice (preferably brown), orzo or a whole grains mix such as Bob’s Red Mill Grande Whole Grains. You could also skip the quinoa and add a mix of beans as Waitdonteatthat suggested.